Driving Miss Donna: Hello Pacific! After leaving the Stecyk cabin on Sunday, our destination was Kamloops. There is a convenient Costco we often overnight in, with a casino adjacent that has a few restaurants and a coffee shop. 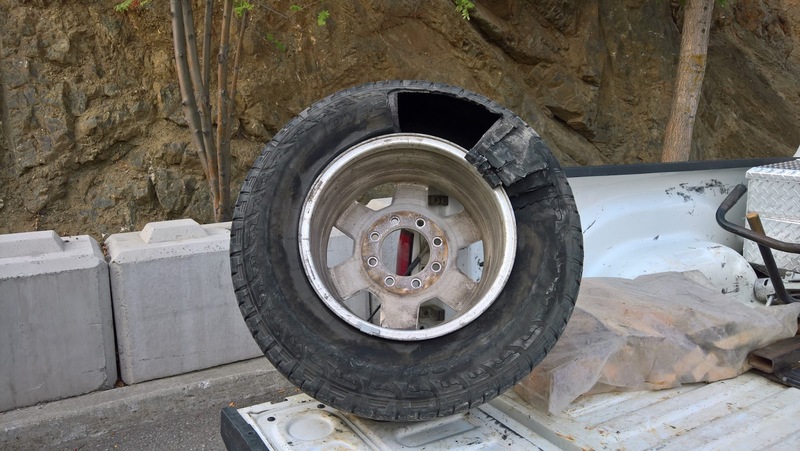 The trip was great to Kamloops, but immediately following a turn on the highway a tire blew. We had just turned and were resuming speed and BOOM!! I always wondered what a tire sounded like when it blew up as compared to going flat. Do yourself a favor and don’t wonder. LOL So the trek to Costco became more time consuming, as we had to change the tire then make our way back. Then began the trick to finding a used tire (hopefully). Add to that it was a holiday the next day and we were skeptical. I started googling and phoning everything that came up, to no avail. Then we started driving to see if they had signage about the holiday. Here’s a thought – if you have a website post your hours, if you have a Facebook page post your hours, and just maybe if you have a door post your holiday hours!! Oh and perhaps on your voice mail???? So as often happens in this world, in looking for one place we found another. They had been open that Sunday so we fingers crossed that in the morning when I called they would be there and maybe have a tire. We spent the evening over beer and wings in the casino, then an hour or so of reading. The next morning Andre’s Tire Shop did answer the phone. What a fortunate find this was – although they didn’t have a matching used tire, they sold exactly the type of tire Don prefers, and the prices after BC taxes were the same as at home. So with 4 shiny new Hankooks we were on our way again. 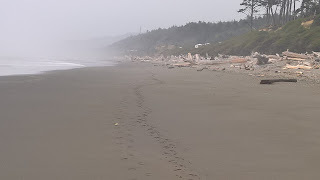 Our original destination on this day was Southbeach Campground on the Washington coast, part of Olympia National Forest. With the tire incident we knew we wouldn’t get that far, but we did get to another lovely Costco parking lot in Olympia, the city. It was the perfect stop with three grocery stores around and a Starbucks! I’m a simple girl, Starbucks can make me very happy. Also there were a few choices for dinner, and so beer and burgers it was! And Wi-Fi, which is just a bonus as you RV’ers know. So with dinner out of the way, groceries loaded and a Starbucks in hand, it was an OK day. The next morning it didn’t take long to head west through Aberdeen and north to Queets. Although it was a bit of backtracking, Southbeach is worth it. 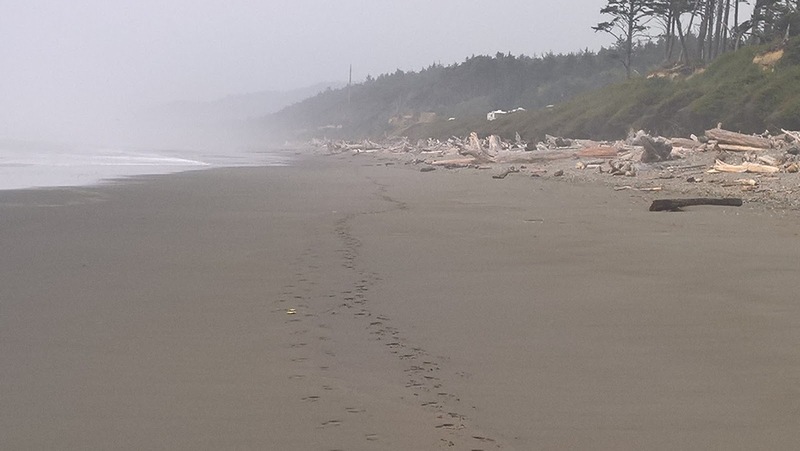 Although Southbeach campground is meant to be overflow for the Kaloloch National Forest Service Campground, we think of it the other way around. Southbeach has almost a random pattern of sites, each with fire pits and tables, and almost everyone is either ocean front or ocean view. It is a 2 or 3 minute walk to the beach from everywhere. Kaloloch is an older development, and hence small treed sites of which we fit few. It didn’t take long to set up the rig and get to the beach. 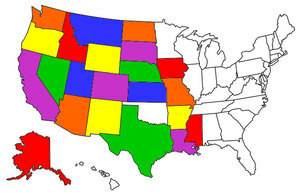 Where our spring trip finds us in search of hiking and climbing trails, our fall trip, if on the ocean, is in search of beaches to walk and sunsets to enjoy. It’s a slow quiet pace which is always good for the soul. While here our day trips consisted of visiting Aberdeen (Starbucks and Wi-Fi), visiting Forks and all the Twilight movie propaganda, and a drive south to Ocean Shores. Highway 109 along the coast from Taholah to Ocean Shores passes through many communities, all of which have their own charm and attractions. But Ocean Shores surprised us. It is much larger than expected and although the last census I could find claims just over 5,000 residents, it seems 4 times that size. I will be curious to see their next count, as there are numerous new developments, many multi family or apartments. I think this is a place to come back to on a different travel schedule. 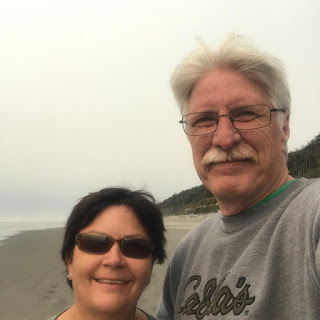 We spent 5 nights at Southbeach before heading to another favorite destination, Astoria OR, and another favorite beach to walk on. The ocean is calling so I will talk to you later!